I have to say, Runaways has been very hit and miss since the departure of the original creative team a couple of years ago. Joss Whedon and Michael Ryan’s run was hit on the art while miss on the story while Terry Moore’s run with first Humberto Ramos and then Takeshi Miyazawa was hit and miss on both art and story. However, after the departure of Terry Moore, Runaways has begun to be a hit across the board again, and the new creative team of Kathryn Immonen (Hellcat and the webcomic Moving Pictures) and Sara Pichelli (NYX: No Way Home) prove they have the voice and the looks right off the bat. Immonen starts the issue establishing a handle on the characters individually through a series of individual moments. Chase continues to have shadow problems with his parents while maintaining a street smart and normal stupid attitude. Victor, Klara, and Molly also continue to have strong voices Immonen appears to just understand naturally. Unfortunately, her handle on Nico has reverted her simply to a matriarchal figure, her original character lost in her newfound need to throw parties and bake. Carolina’s characterization is another weak one, with Immonen having to revert to blatant telling and monologue to establish how she feels. The story itself is almost quaint, Nico organizes a prom for the four senior members and it turns into a moment between Nico and Carolina orchestrated by Victor and Chase. The relationship between Nico and Carolina will be one to watch in future issues with Carolina’s fiance Xavin having recently departed. Overall, the writing of the issue has been the best in a long time and I look forward to where the new creative team takes the series. 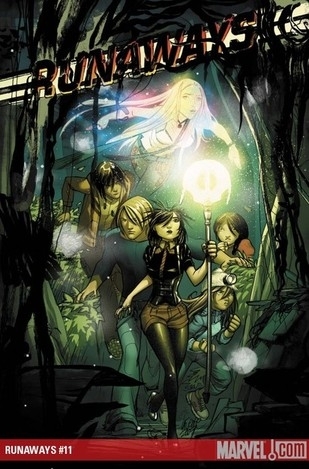 Sara Pichelli is a good choice for a series like Runaways. Her ability to play with emotional expression while not becoming exaggerated is very reminiscent of original series artist Adrian Alphona. Helped by series artist Christina Strain, who has coloured every issue of Runaways, Pichelli’s art fits perfectly. She does borrow heavily from Alphona, notably with a scene near the end with Chase which mirrors a panel of Alphona’s. While this may seem like mimicry, it is actually more along the lines of the return to form the series has been enjoying in just two issues. 8.5/10 While too early to tell, the series is certainly returning to its former glory.